Dressing well becomes a matter of habit, over the years. You get used to wearing long socks, or high trousers, or being draped in slightly heavier cloth. But these habits have to be instilled. One I find most powerful to instil, through conscious repetition, is wearing a jacket - inside ideally, but at least outside. A jacket has the capacity to sculpt and flatter you, to create an idealised silhouette (whatever that ideal might be) by shaping the shoulder and slimming the waist. It will always look better than just a shirt, which comfort requires to be a little loose; and whose lack of structure means it will always be rumpled, never sharp or clean. Wearing a jacket just makes you look better. Yet how many fail to put one on when popping out to get lunch? It is laziness or forgetfulness: unthinking actions that can really only be fixed by establishment of habit. Even if it’s freezing outside, you will often see people scampering out of their offices and across the road in just a shirt. It might be raining, but they’ll gladly get wet rather than put on a jacket and take an umbrella. What hope, then, of suggesting someone should wear a jacket inside? Perhaps not when sitting at the desk for hours on end, but when walking around the office, or going to a meeting. People buy better, smarter clothes when they want to give the impression of seriousness and often seniority. There’s no more powerful way to do that than to wear a jacket, and no point in owning one if it’s never put on. A jacket doesn’t need to mean formality, either. 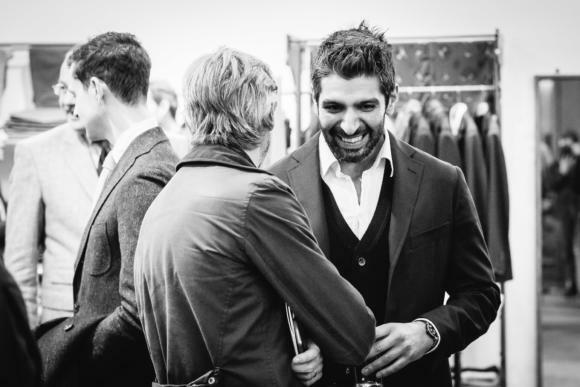 Wear a Boglioli cotton jacket with jeans and an open-necked shirt - it’s still better than just a shirt. Better still, of course, is to wear a tailored (even bespoke) jacket in a cotton, cotton/linen/silk mix, or perhaps cashmere. Over denim, chinos, or flannels. With a good-looking shoe. All will raise you up - make you look put together. As in the opposite of random. Force yourself to always wear a jacket when going outside. Have it hanging conveniently nearby, if not worn already. Make that tiny effort to put it on, even if you’re late. And do it until it becomes habit. 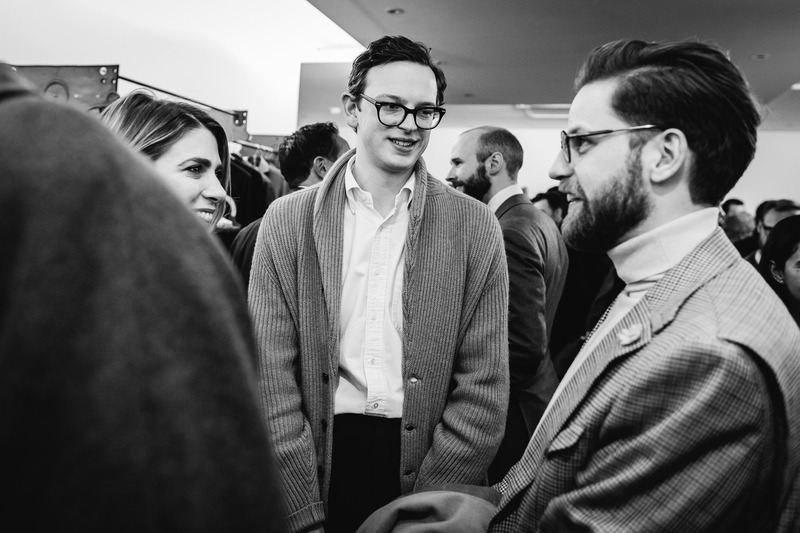 Of friends and some attendees (largely jacketed) at the opening of our Pop-up Shop this past Spring. You can follow the discussion on Wear a jacket by entering your email address in the box below. You will then receive an email every time a new comment is added. These will also contain a link to a page where you can stop the alerts, and remove all of your related data from the site. I completely agree.A jacket sharpens up one’s appearance and flatters the wearer.Even on holiday a shirt jacket does the same trick! To add a little variety I think a short slim fit cotton sweater pulls an outfit together on a warm summer’s day….a jacket is preferable but in it’s absence I think knitwear can work on a slim guy. Absolutely. As a side point, I also think any air conditioning in an office should support a lightweight jacket or thin sweater. Do you wear long socks with jeans and chinos, Simon, or just with suits/tailored trousers? Let me play devils advocate and put the argument against the jacket. The jacket is a rather odd and at times uncomfortable item of clothing . Making one feel restricted, climbing up the back when seated, exposing the upper chest and front of neck to the weather and having useless buttons on the sleeve! Now let’s be civil and remember we read PS because we are gentlemen pursuing elegance . So having said all that the reason we wear a jacket is because the silhouette a jacket gives is extremely flattering. More generally Simon, do you know or would you recommend any RTW jackets sporting a full canvas and high armhole ( which would answer back to the ‘devil’ above)? The only ones I’ve seen recently are Crombie? Also, does full canvas make a great difference over half canvas? I’m not great on RTW jacket recommendations I’m afraid, as it’s not something I really wear or write about. A full canvas tends to mean the bottom half of the jacket retains its shape and line, which will generally be more elegant. It also means a little bit is being spent on the make of the jacket. If a RTW jacket is half-lined, can it still be half- or fully canvassed? In other words: What’s the relationship between canvassing and lining? I think canvas is opposite to fused and canvassing or fusing has to do with structure, whereas lining is just another cloth? I ask this because the other poster refers to Crombie. Yes, that’s right. The two are not connected. Your devil’s advocate position is just another of the myriad excuses people use to dress poorly. Simon’s point that a man looks better with a jacket on is TRUE, despite all the juvenile attempts to suggest otherwise. I agree with Scott. A jacket that fits well is not going to be restrictive or uncomfortable, and believing that is a silly reason not to wear a jacket. The fact that the jacket doesn’t completely cover me is what keeps me comfortable. A jacket that fully covers the torso is going to be too warm for me to wear indoors in the winter time, so the design of the jacket is actually more practical than you think. I put on a scarf when the jacket isn’t enough to keep me warm outside. Hear hear! Bien dit ! I often wear bags but my problem is that I have a backpack and a tote that I wear on my shoulders. Therefore, I have restrained myself from wearing jackets as it ruins them……so, what is your recommendations for bags that I can wear jackets with or suits with? Never wear a backpack, I’m afraid… Not practical over anything finely made unfortunately. Stick with just the tote if you can. Ah – this is obviously the week for the Crompton polemic. These seem to come up every two to three months and are one of the things I most enjoy. Vent your spleen more Simon – it makes good reading. That I completely agree with everything you have written makes it even more enjoyable. In fact to paraphrase the great Bruce Boyer – there are two types of crazy people; those who think they are Napoleon and those who think they can buy a good jacket cheap. Women have purses. Men have jackets. I always wear a jacket. Even when I walk the dogs. Tweed or cotton. On hot days a linen jacket. In the pockets I carry my reading glasse, phone and credit card. And as you point out, Simon, a good pair of shoes. Brogues for walking the dog and loafers for a trip down to the shop. My jackets are informal but they make me look put together. Thanks for a lot of great articles and carry on, Simon! Interesting (perhaps only to me) to see so many jackets undone in those photos — does that not negate the benefit of wearing a jacket to create a pleasing silhouette? Couldn’t agree more with this. Great article. Whenever my girlfriend and I go out for dinner, I’m always astonished at the number of men who don’t bother to wear a jacket, even to ‘special occasion’ restaurants. Mind you, it seems to bother me 100x more than it bothers the girlfriend, so perhaps I’m the snob! Yes but I do look down my nose at them and so should you! Let’s weed these Philistines out ! Dan – interesting that you mention the girlfriend doesn’t appear to mind. I recently commented to my wife that there seems to have been a real shift in women’s expectations of what men wear. I’m only speaking generally of course and generationally specifically. So very often I see couples in their 20s-30s where the lady has clearly made a real effort yet their fella is dressed in a T-Shirt & Jeans. They seem happy enough so must assume this isn’t an issue for them but it strikes me as odd. Yes! I don’t get it either! Interesting point DKP. We’re both in our early 30’s and I definitely agree that there’s a bit of a ‘style clash’ in many couples we sometimes go out with. The ladies still tend to ‘dress to the nines’, whereas the guys wear a really variable array of things. It’s easy to blame ‘disposable fashion’ for everything, but I think the high street really has a lot to answer for in causing this. Personally if I’m going out to a restaurant, be it a Michelin star ‘special occasion’ or a local restaurant down the road, I don’t feel comfortable unless I’m wearing a collared shirt and a jacket. The exception might be if the two of us pop out for a Sunday lunch at a local pub I suppose. Even then, a shirt with a fine crewneck or a shawl-collar cardigan would be the minimum. The truth is that it does bother the girlfriend, if she’s honest, and it’s disrespectful of her boyfriend to dress like a slob. My default would be to always wear a jacket however … I’m easily prone to over-heating even on a mild day. The obvious answer I suppose would be to wear jackets of a lighter weight but surely there comes a point where the weight of the jacket and the season won’t quite match up, ie you’d look rather odd wearing a light linen jacket at the start of winter. What to do then? Simon, this was an excellent and important article that your regular readers I’m sure appreciate. Would your jacket recommendation also apply when a man has on jeans or chinos with a polo or tee shirt and tennis or deck shoes in the Summer? No. But a linen overshirt would be nice. Absolutely – Jason King would be proud of you ! He always found a reason for a jacket, of sorts, for all seasons. I live in Hong Kong and do find that when the humidity creeps above 80% and the temperature into the low 30s, even unlined lightweight linen or hopsack nonetheless makes me hotter than I would be with a shirt alone. Moreover, whatever material you are wearing, people around you think that you look uncomfortable, simply by virtue of wearing another layer that everybody else forgoes. Sorry to ask this question here, might not be the best place. Would you sport a seersucker jacket ? And if you would, withzwhat kind of trousers ? Thank you for your answer and for permanent style. Bravo Simon. Very good post . Wearing jacket is very good habit. Personally I wear bespoke jacket practically every day (except august at Côte d’Azur)). 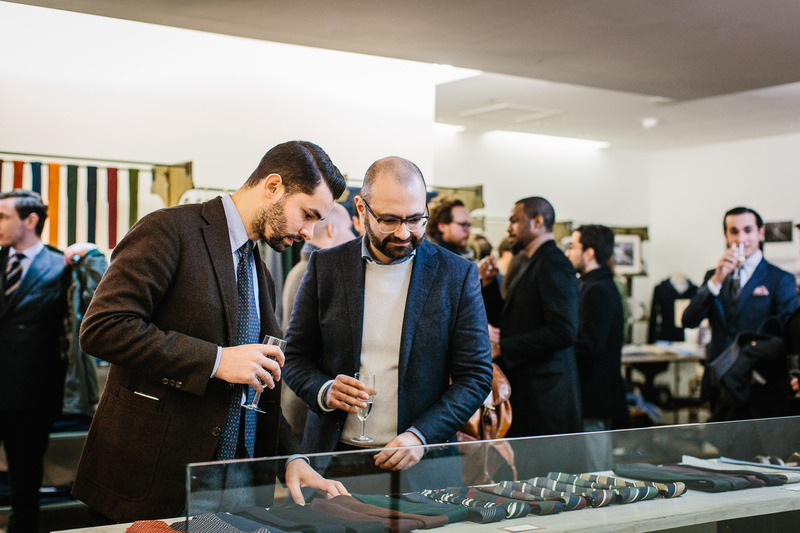 Now I have about 40 bespoke jackets from 5 different Sarto’s (all neapolitan). Very well said Simon! I know you’ve said in the past you don’t love tebas, but I’d love to hear your thoughts on other “jacket alternatives” that might provide some of the same aesthetic benefits as a jacket, but in more casual contexts. If you were to try to recommend a single jacket color/fabric for regular use in Southern California, where it’s been getting notably hotter and more humid every year for a smart-casual wardrobe, what would it be? Bottoms are chinos in khaki, olive, stone, navy; indigo denim; grey trousers. With most of the chinos (save navy) a blue jacket seems right in a linen or wool/silk/linen combo, but can’t do that with jeans or navy pants. A grey jacket in linen or unlined wool would work well with jeans as your post from some time ago indicated and could go with navy pants, but seems sort of limited otherwise. Is the right answer to have both, or is there another option I should be considering? I can swing a bespoke or MTM for one but likely not both at the moment. Appreciate any thoughts! Three points about the gaping divergence between female and male apparel in social settings (disclaimer: I’m male, myself). 1) Consider that the blighter in the graphic t-shirt / ugly print shirt, jeans and square-toed shoes MIGHT actually have dressed better due to consideration for / pressure from his companion; lacking which he might have worn something even more scabrous. 2) If a woman has become accustomed to professionals going tie-less, family attending important events in casual clothes, etc., she won’t feel justified in asking her partner to wear more than unsoiled clothing to go to dinner. 3) Contemporary culture places some value on aesthetics but a much greater value on ‘youthfulness’ and as long as that is associated with ultra-casual grooming it conflicts with a request for more elegant / formal clothes. Indeed I have heard of chaps being asked to dress down by their partner. The best basic advice I can think of! This article is perfectly timed. I’ve been trying (and largely failing) to adopt this mantra and you’ve provided the extra encouragement I need to ignore my concern about looking overdressed in my environment. Practice makes permanent. Wonderful, thank you. I would love to read more of this – i.e. general thought on what is to be done what is not to be done, forming a philosophy of sort. What brand is the bold, chubby gentleman in the second picture wearing? It looks very stylish. I have the same posture as him and I couldn’t yet find a good looking blue blazer to wear with a white shirt and a chino. I can ask, but it is likely to be Drake’s. He is an employee. Hi Simon – love the article, do you mind if we share it on our Facebook/Twitter? I am a pharmacist in the US, so I wear a white lab coat every day at work. However, I leave my house every morning in a shirt, tie, and trousers with no jacket (since I do not put the lab coat on until I am actually in the pharmacy). I hate this. One of the first things I learned as a young man was never to wear a shirt and tie without a jacket. 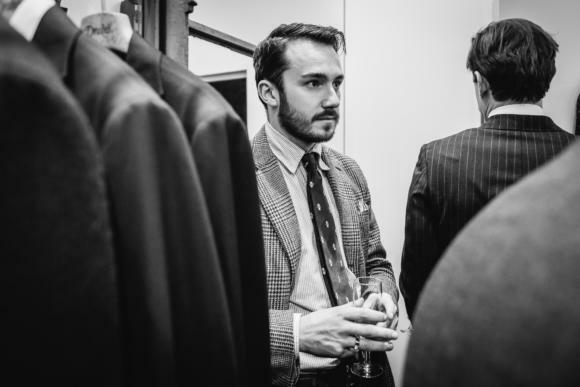 I have been thinking about wearing suits daily instead (I love classic menswear and have amassed a collection of about 14 suits that I rarely wear). I could then swap the suit jacket out for the lab coat when I arrive at the pharmacy. I just don’t like walking out of the house without a jacket, it almost feels like I am not completely dressed. It is especially troublesome if I end up going to the store or out for a meal/drinks after work. I have been considering making this change for a while now but part of me thinks it may be a bit much for a pharmacist to start wearing suits daily. I was wondering if you would offer your opinion on my dilemma? I think you should start Bryan. It would make you look better, make others treat you differently, and by the sounds of it make you feel better. Excellent post. How do you feel about pairing a cotton jacket (woven or twill) with light grey flannels? Can the two materials work together? Can anyone help with recommendations for a Glen Check or Gun Club check blazer. Drake’s seem to do a great line but (a) at 6′ 4 and broad I don’t fit them, and (b) I’m looking to spend a less than what they stock. But the patch pocket and unlined style is spot on. I love sartorial fashion but my body shape means RTW and MTM never get close to fitting well but my budgets only just about stretch to occasional pieces from the entry level tailors like Graham Browne. Unfortunately my hit rate on choosing fabrics hasnt been great, navy work suits all fine but mid grey had a brown colour cast that I didnt notice and didnt want. Similarly my navy basket weave jacket was far too formal and brown tweed jacket “too country” but a tobacco linen was good. Looking to invest in another jacket, one that I could wear with cotton twill trousers for the semi-dress down fridays we have in the office or a pair of jeans at the weekend. I was thinking of a mid-dark grey or navy herringbone tweed jacket, maybe in a cashmere blend, but worried about my ability to select fabric from the small sample and two of the above examples of failures were from when the tailor was helping. Are there any pointers you can give for that versitile basic garment that should be a staple item? Even better is there any fabrics you’ve seen recently that would match the bill? How about a post on how to avoid the rut of wearing the same outfits repeatedly? I often feel like I need to “play it safe” and go with combinations that I know work. I imagine this is a phenomenon that many of us experience whilst building a wardrobe. Thank you as always, Simon. I am planning to to get a casual RTW blue jacket with a 1200 eur budget. What places would you recommend me in London? Anglo Italian? What about Drakes tweed jackets? I do not like a high buttoning point or a ver y short stuff. Something unlined with a comfortable cut would be perfect for me, ideally with patch pockets and a soft shoulder. Outside of Eidos, what are good options for a soft sport coat that won’t break the bank? My budget is about GBP 400 so that would rule out Graham Brown. What do you think of Boglioli? Thank you, Simon. Are there any other brands of similar quality and in the same price range that you would recommend? Thanks for your advice (you mean the plain gray one I assume?). Would Boggi be a better alternative? And a shop I know carries a brand called Ugo Fabiani. The owner says it’s all made in Italy, and better quality than Boglioli and the likes. Have you heard of it? I haven’t been able to find anything about them. Hi Simon, the comments generated by this piece are a lot of fun, and you make a good point. Wearing a jacket is a habit I’d like to get into. At work, generally the “higher ups” wear suits and ties, the assistants slacks and shirts and sweaters; when one wears a jacket, it’s commented on (positively) but not required. I noticed how well put together the older gent is in the last photo, with that lovely large check jacket. 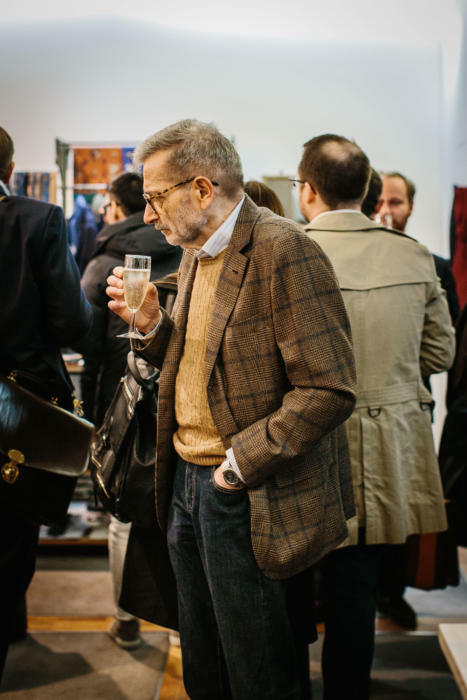 Older men who have the habit wear jackets organically, and know how to pair them with sweaters, cardigans, etc., in pleasing ways, especially tweed, etc. Do you know who made his jacket? I notice it works well with the quite dark jeans. And plays off the lighter sweater. Do you think that knitwear, especially a cardigan (regular or shawl collar) can take the place of a jacket in more casual situations? What are yours thoughts on wearing (a casual jacket with) chinos and a tie? Hey Simon – rediscovering this great piece whilst considering jacket options for autumn/winter. With a view to achieving a casual out-of-office look, what’s your view on pairing a cotton jacket with flannel trousers? Obviously it would have to be a fairly heavy duty cotton, but would you generally prefer wool or wool blend instead? Many thanks. It really comes down to habit. I for one had to wear a jacket every day for school. Plus a jacket and a tie every Sunday for church. So for good years of my youth I wore a jacket 6 days of week. When I went to university I didn’t have to wear a jacket. I tried to enjoy my freedom, doing that t-shirt and jeans thing. And it felt awkward. Then I started layering cardigans and found a nice mock neck flannel over shirt that I wore like a jacket. But it just wasn’t the same. I attribute the position and the track my career took to hard work, but also to leaving a good impression to a senior partner who’s wife was from Italy. I was the ONLY one wearing a jacket out to dinner after a conference and she happened to join us that night. She complimented me on my dress and said how much she missed men dressing like men. After that I started getting more attention and bigger accounts. I still prefer to wear a jacket and still insist on wearing one when I board a plane. People don’t realize how comfortable a nice constructed jacket can be. It’s much better to keep your phone, pen, and wallet in your jacket, than to stuff them in your pants pocket or carry them in your hands. This ofcourse means that the latest large screen smart phones don’t work for me, because of the unsightly bulge in the chest pocket. Then for a period of one year, when our family moved to a coastal city in Southern California I couldn’t wear a jacket around. I seemed like the only people that wore a jacket were people that worked in clothing stores or car salesman. Wearing a shirt with a collar and a sweater is considered dressing up in winter here. The Nieman Marcus in my neighborhood has the smallest men’s tailoring section I’ve ever seen, but also the most stock leftover even until the clearance sale…so no complaints in picking up that Loro Piana jacket at 50 off, where as in my home town it would be gone a week after it came into store at my size. But again, it’s just not the same. Those knits are missing that sense of security, that feeling you get when you wear a proper jacket. So recently, I just started wearing my jackets again (mostly the unconstructed kinds I wore on casual days at the office like Boglioli, Barena, Ring Jacket) and if you wear out enough then your neighbors stop asking “going somewhere special?” They just think that’s how he dresses. My wife says it’s nice to see that man she married 13 years ago.